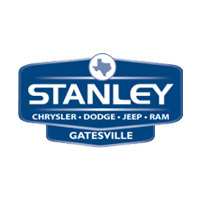 So you’ve decided on a new Chrysler, Dodge, Jeep, RAM or used car from Stanley Chrysler Dodge Jeep Ram Gatesville. Now, it’s time to make it your own. To help, our certified car loan and Chrysler, Dodge, Jeep and RAM lease specialists are willing to crunch the numbers and renegotiate as many times as it takes to get you the auto financing terms and conditions you deserve. You. Not your neighbor. Not your business partner. You. Our personalized approach has been created to try to get you terms that are flexible, tailored and workable. Additionally, we’re committed to using straightforward language and engaging in transparent conversations, which any of our previous patrons will tell you makes the financing process a lot easier to swallow. If you’re ready to apply for a car loan or lease from Stanley Chrysler Dodge Jeep Ram Gatesville, contact our Finance Center online or by phone. Alternatively, you can always drop by 106 S. Hwy 36 Bypass N, Gatesville, TX during our regular business hours. To get a head start, you can begin the application process using our e-form.